In 1996 I developed this notational system of Sanskrit in order to do my transliteration of the Bhagawad Gita, which in my system would be written as the BhaGaWaD GiiTaa; transliterated, the language's name is SaMSKrTa. 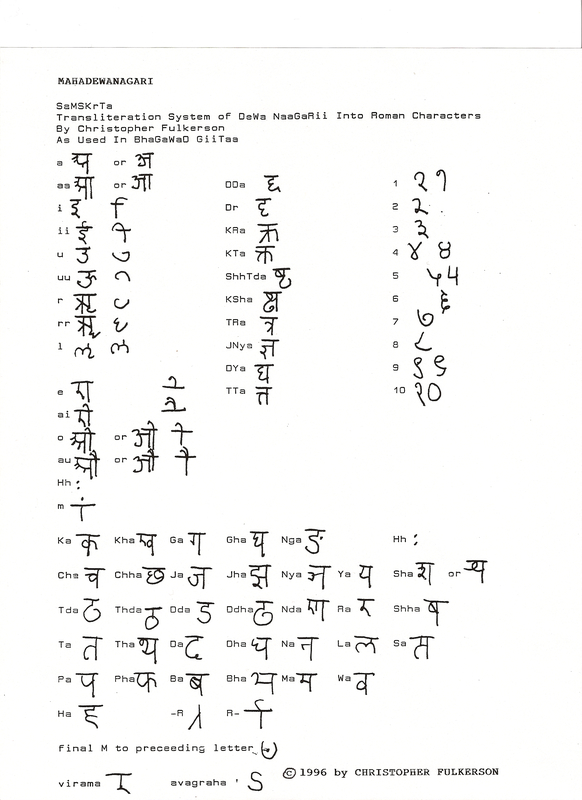 The idea was to finally have a system of Sanskrit transliteration which one could type using the ordinary Western typewriter, which often lacks the extra symbols that have been used to transliterate Sanskrit into Roman characters. The advantage of this system of Sanskrit transliteration is that with it you can easily go backward from the Roman characters to the Dewanagari. This is a succinct one-page overview of the system; it includes the major exceptions. For a more complete view of Mahadewanagari, see my complete transliteration of the BhaGaWaD GiiTaa. I have an occasional correspondence with Mr. R.P. Jain of the distiguished Indian publishing house Motilal Banarsidass. He and I met in my cab and when he learned of my Sanskrit studes and that I am a Ph.D. in Classical Music, he expressed amazement at my situation, as any person with proper perceptions should, that I am having to drive a cab for a living. He endeared himself to me when he said of my lifelong plight "This would never happen in India." Mr. Jain has suggested I forward the following links to anyone who is interested in Classical Indian languages and philosophy, or India in general. But if you navigate away, please come back soon... maybe you should bookmark my site before leaving, if you do?